If you are feeling bored this winter or just don’t know what to do, why not invite the family or friends around for a make-your-own-pizza-party! It’s the perfect way to do something different, and if friends and family have kids it will certainly keep them amused and happy! 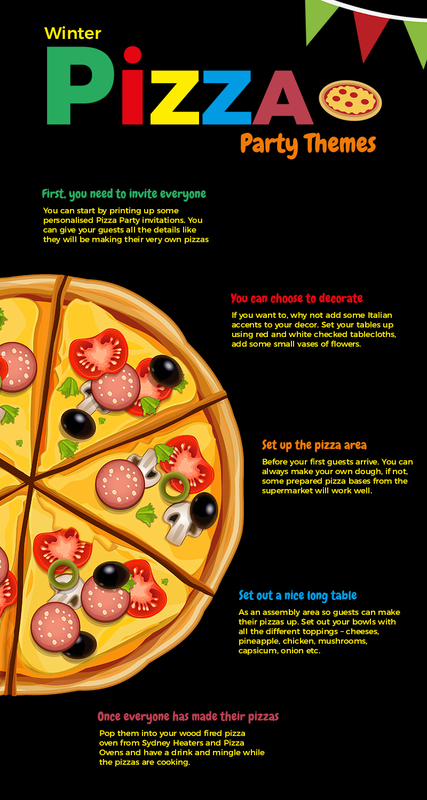 The good thing is, making pizzas is so easy, and your party will be a standout – one your guests will remember! First, you need to invite everyone, you can start by printing up some personalised Pizza Party invitations. You can give your guests all the details they’ll need – the time and place and that they will be making their very own pizzas for the meal. It’s probably a good time to tell them to bring an apron and a chef’s hat (if they want to go that far). Make sure you have a set RSVP date to ensure you have enough of everything ready for the night – you certainly DON’T want to run out of toppings. You can choose to decorate if you want to, why not add some Italian accents to your décor. For example, list all the ingredients you have available for those making pizzas and hang it up so your guests know what you have to offer. Set your tables up using red and white checked tablecloths, add some small vases of flowers and if you have any leftover wine bottles, top them with a candle to present an Italian atmosphere. Turn down the lights and let the candles work their magic. Whatever you do, if you are making up pizza’s in the kitchen or in your outdoor pizza oven, make sure there is plenty of light! Set up the pizza area first before your guests arrive. If you know what you are doing, you can always make your own dough, if not, some prepared pizza bases from the supermarket will work well and you can always freeze whatever is left over. Set out a nice long table as an assembly area so guests can make their pizzas up. If you use a disposable tablecloth you don’t have to worry about spills or mess, just roll it up and toss it in the bin at the end of the night. Start your pizza line up with basic marinara sauce, along with pesto, alfredo or olive oil for variety. Set out your bowls with all the different toppings – cheeses, pineapple, cut up ham, bacon, chicken, prawns, mushrooms, capsicum, onion etc. Have extras in the kitchen of the popular toppings so you don’t run out of anything. Once everyone has made their pizzas pop them into your wood fired pizza oven from Sydney Heaters and Pizza Ovens and have a drink and mingle while the pizzas are cooking. Once cooked serve everyone’s pizza on red, white or green paper plates.